This event was available from Monday, 26 March 2018 12:00 AM until the event start date. Don't miss this chance to learn from Steve Angrisano! This event is for all youth leaders, aspiring leaders, volunteers and musicians! This event is created to empower each participant and breath a sense of renewal and commitment to the task of ministry. 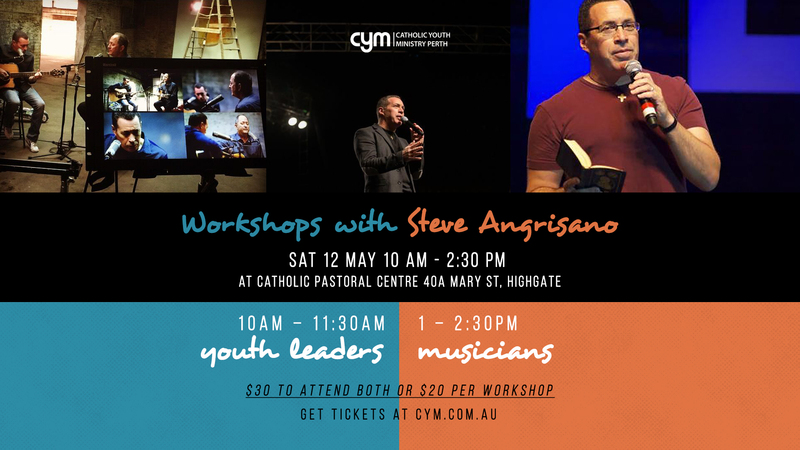 Steve’s music workshop, while particularly well suited for more contemporary styles of music, shares invaluable tips on music in worship for any ensemble and, filled with inspiration and humour. Note: A maximum of 1 ticket can be purchased per billing address. Orders that fail to adhere to published limits are subject to cancellation without notice. Payment is to be made via invoice sent to the school. Confirmation of payment is required to secure your spots. Payment is due by 30th April Monday. Full balance due by 30 April 2018. STEVE ANGRISANO, singer, songwriter and storyteller will be once again returning to Australia for a National Tour in May 2018. This annual event has become a source of pure joy for Steve and a gift to so many schools, dioceses, parish communities and prayer groups throughout the many regions of Australia. This will be Steve’s 6th year embarking on a tour of Australia. His ministry reaches new depths and breaks new boundaries every time he visits as he has developed a deep love and devotion for the people of Australia.